Belvedere Designs: October 2016 Customer Photo Winner! October 2016 Customer Photo Winner! When Crystal contacted us for a custom Wall Quotes™ decal - I was excited to see where she was putting it. 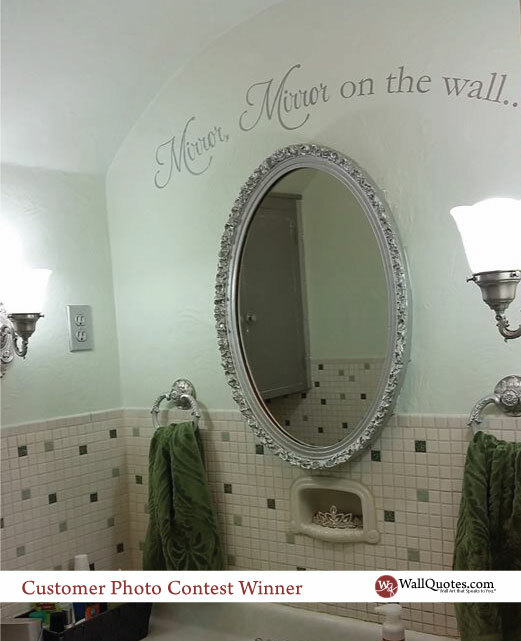 When I saw her Mirror, Mirror on the wall... decal in her bathroom, I was so excited for her! What a great way to update a bathroom when you can't gut and re-do the whole room. Did you notice the crown in the soap dish?! LOVE! And I definitely need that mirror in my life! Great job thinking outside the box Crystal! We love it all!